European equities are set to drift lower on the open as markets take time to ponder just what is going on. Following the Fed's double back flip somersault u-turn on tapering, market uncertainty has soared to baffling heights. Should bulls be hoovering up equities because tapering is off the table and the policy of 'QE to infinity' has come back into fashion? Or is this a prime opportunity for bears to get short at artificially elevated levels because tapering is merely on pause and set to bite the over optimistic just around the corner? Who knows? Because the online spread betting markets certainly don't seem to. The Dow Jones took a breather yesterday, retracing 35 points to 15,632 but not before touching a fresh all-time high at 15,722 in the first part of the trading session. This came in the face of strong US economic data which would usually have acted as the trigger for another rally in stocks. Investors must have been wondering why the Fed is still not convinced that the US recovery is sustainable. European equities are expected to have a huge gap higher on the open as Bernanke bottles out of tapering. After all the Fed's efforts to prep the CFD markets for the winding down of their asset purchases, a few shaky payrolls figures and weak economic data points have caused them to get cold feet. The market had been expecting a $10 billion reduction in asset purchases, but the committee refrained from cutting any stimulus at all and kept the benchmark interest rate at record lows of 0.25%. The surprise understandably sparked a sharp rally in US stocks, pushing the Dow 131 points higher to a new all-time high of 15,170. The unexpected boon for the bulls will certainly re-price assets higher, but any future movement will still be plagued with just as much uncertainty. The more creative bulls amongst the trading community are now toying with the idea that tapering won't happen at all. There are only 2 FOMC meetings before Bernanke leaves and the October one doesn't have a press conference scheduled so it seems unlikely that tapering would be announced then. Also, with the December meeting being Bernanke's last, he may not want to mar his legacy by doing a 'Trichet' and tightening policy only to have his successor reverse it. So, some bulls would argue that, with the issue of tapering now looking to be in the hands of uber-dove Janet-Yellen, any form of tightening is off the table for the foreseeable future. Ahead of the today's FOMC statement, investors in the US felt rather optimistic, pushing the Wall Street index 52 points higher to 15,541. Following that, European equity markets are set to edge up on the open as the bulls hope that the Fed will merely chip away at their asset purchases, rather than take an axe to them. Consensus opinion that the Fed will begin tapering seems to have been priced in and, with equities still lingering at relatively expensive levels, the markets aren't expecting anything too drastic, something in the region of a $10-20 billion reduction. However, as always, the possibility of an outlier announcement is likely to keep traders on the sidelines for this session and they will look to digest the results tomorrow. After such an agonising wait and volatile period of adjustment to the idea that the Fed might start withdrawing its stimulus, the one scenario that could cause the most market mayhem, albeit upwards, is if the Fed gets cold feet. The Fed has always reiterated the point that the withdrawal of stimulus is data dependant, but recent readings have been disappointing, particularly the last two payroll figures. With the sluggish US recovery starting to wobble, will Bernanke want to risk his legacy as they guy who kicked away the crutches just as the US was getting back on its feet? Lawrence Summers, one of the favourites to replace Ben Bernanke next year, withdrew his bid for the Fed Chair and sparked a sharp jump in US stocks. On top of that, it appears that the US and Russia made progress in striking a deal over Syria's chemical weapons which further offered support. So, the Dow Jones moved above 15,500 in early trading and only retraced to 15,491 towards the close. 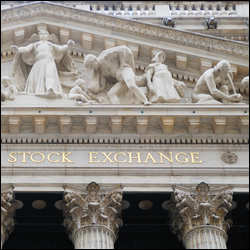 Nevertheless, after the initial bluster of the Summers news wore off, the more pressing issue of tapering regained most traders' attention and markets have returned to a pensive state. As a result, European stocks are set to drift lower on the open as attention refocuses on this week's Fed meeting. Considering that most indices are on or approaching all-time highs, it looks like markets are starting to believe that the economic fundamentals really have turned a corner. Either that or they think that the Fed's reduction in asset purchases won't actually be full blown tapering but more of a very gentle 'sanding'. Either way, with such a large inflection point ahead, we don't see markets making any major moves until after the FOMC. European equities are set to surge on the open in a bit of a kneejerk reaction to the news that Larry Summers has withdrawn from the race for the Federal Reserve Chair. Bulls will argue that it's good news because it now leaves the door wide open for the dove Janet Yellen to take over. However, whilst markets have taken the news positively, we feel that any further gains will be capped ahead of this week's more pertinent FOMC meeting. Markets appear to have become comfortable with, and even priced in, the idea that the Fed will begin tapering its asset purchases this week, with the Dow Jones rallying 69 points to 15,380 on Friday. The debate and driver of sentiment will now be on how bullish or bearish the size of the taper will be. Expectations seem to have rounded on the figure of a $10 billion reduction as acceptable but markets should be weary of anything bigger which could kick off another market taper tantrum.